Ozone layer continues to heal. The SBC is a conservative evangelical denomination, and the largest Protestant faith group in the U.S.
David Roach, writing for the SBC on 2018-OCT-09, quoted John Christy. 1 He is a former lead author for the UN Intergovernmental Panel on Climate Change (IPCC), a distinguished professor of climate science at the University of Alabama, and a former Southern Baptist missionary. "Look at the real data. Remember that human life is precious. And thus providing access to [energy sources] that enhance human life is really the moral track to take here. I just wouldn't be too excited about these reports from government entities like the United Nations." He recommends greater use of fossil fuels to improve living conditions worldwide, and to ignore the adverse effects that this usage will have on climate. "... no one knows the percentage of warming that may be due to greenhouse gases, [though] in our research it doesn't look like much." "... isn't really a serious proposal. ... [because] the people who came up with this report and the people who are reporting about the report are flying on airplanes, and they are driving in cars, and they are using all the artifacts of the Industrial Revolution which the report implies should be scaled back. ... There is a deep anti-humanism that runs through so much of the ecological movement." "When you just look at real-world data, you don't find the catastrophic changes occurring [as claimed by some environmentalists. Even the IPCC has to admit tornadoes actually have declined in the United States in the last 60-70 years. Atlantic hurricanes actually have declined in the last hundred years." He is apparently referring to the number of hurricanes. There is an honest disagreement among climate researchers about whether hurricanes are becoming more or less frequent. But there is general agreement that the intensity of the hurricanes is increasing, along with the damage that they are causing. "... "make sure the poisons don't go into the atmosphere, like the sulfur dioxides and the nitrogen oxides." Christy's comment seems strange, because the most serious climate damaging greenhouse gas is generally agreed to be Carbon Dioxide. "... on global warming [urged Southern Baptists] to proceed cautiously in the human-induced global warming debate in light of conflicting scientific research. ..."
"... might not look or feel quite like it has in the past." drought conditions which cause early leaf drop. 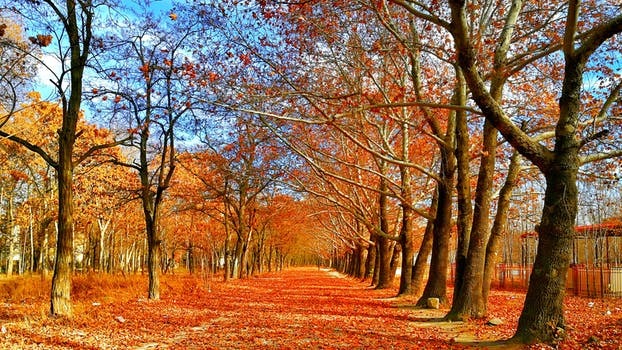 elevated levels of air pollution, ozone and carbon dioxide which can negatively affect leaf colors. 2018-OCT-25: What worries Mary Sue Coleman? A UN-backed report on the status of the ozone layer is issued every four years. The latest is titled "Scientific Assessment of Ozone Depletion: 2018." UN News reports that the report indicates that the concentration of ozone-depleting substances in the stratosphere continues to decrease, resulting in a slow improvement in the ozone layer. Ozone has recovered at a rate of 1 to 3% per year since 2000. This improvement is due to action taken at the Montreal Protocol on Substances that Deplete the Ozone Layer which entered into force during 1989, almost three decades ago. "The Montreal Protocol is one of the most successful multilateral agreements in history for a reason. The careful mix of authoritative science and collaborative action that has defined the Protocol for more than 30 years and was set to heal our ozone layer is precisely why the Kigali Amendment holds such promise for climate action in future." "Resist the temptation to make claims about long-term [climate] warming based on short-term localized weather." "QuoterGal" tweeted an image of the Titanic sinking with the front end under water and the back in the air. The caption reads: "If we're sinking then why are we 200 feet in the air? Republicans on Climate Change." "Tom" tweeted: "It’s really a problem when the leader of the free world does not understand global warming and climate change. Education and Science matters. Global warming does NOT mean you won’t have cold snaps." "Gregory Thomas tweeted: "People aren't as stupid as you think. We know the reason you won't recognize warming is that it would mean the regulating of all those companies that are destroying the Earth while providing you the materials you need to make your millions. You are the cause of global warming." "Marta Baker tweeted: "I ate today... does that mean world hunger doesn’t exist? Because it’s the same argument." "VickiM" tweeted: "Trump is heavily invested in oil, as are those who fund his interests. If he was heavily invested in clean energy, he'd have a different opinion on climate change. Simple as that." Olyver Weisenberger summarized President Trump's problem neatly by tweeting: "It’s global warming, not local warming. It’s climate change, not weather change." Image downloaded from pixels,com at: https://www.pexels.com/ They provide free images.